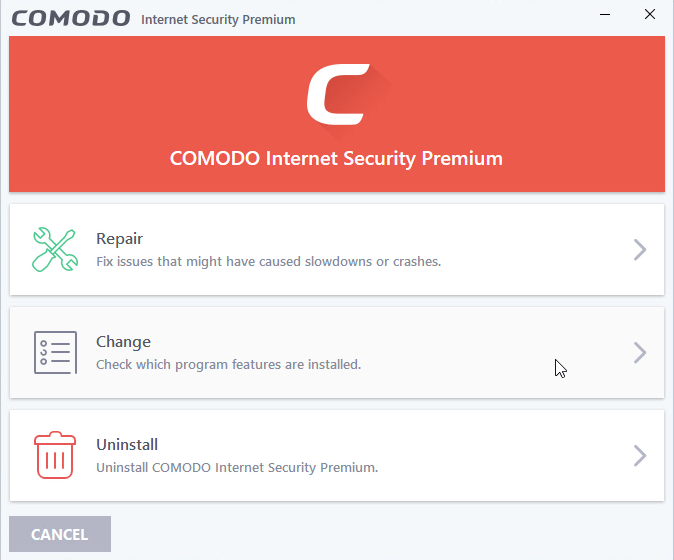 I t is really so hard to completely remove Comodo Internet Security Premium 2019? a. Security programs is generally difficult to remove, because developers did that to fight against viruses and other threats. b. Installing more than one of them will cause conflicts, and your computer will become slower than before. So, never do this. 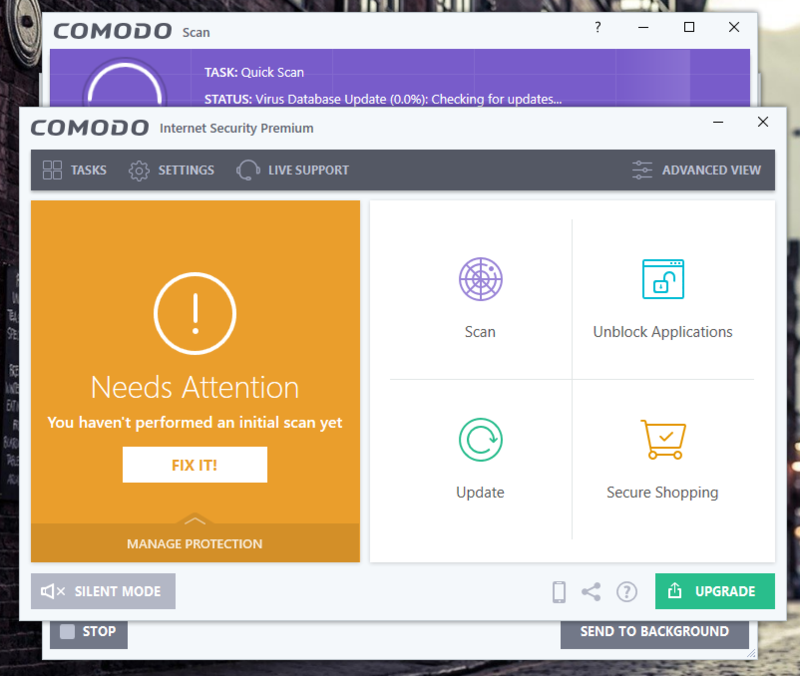 How to completely remove Comodo Internet Security Premium 2019 in Windows? Special steps have been listed below. 1. Shut down Comodo Internet Security Premium. Quit the Comodo Internet Security Premium program from running in the background no matter what. It may not be necessary towards the removal of some programs, but just in case. 2. 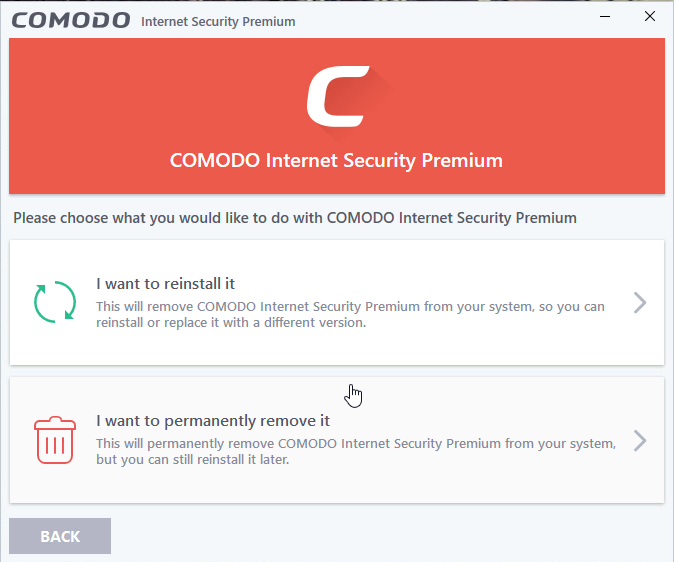 Remove Comodo Internet Security Premium 2019 by activating its built-in uninstaller (2 Options). Start screen: Click Start > Click the Down arrow > Locate and double-click on COMODO Internet Security Premium > Uninstall. If you haven’t shut down the program in the beginning, you will receive the message below. Just follow the on-screen instruction to confirm the uninstall, and wait for the built-in uninstaller to finish its part. Then we get to clean out the lingering files. 4: Open the Windows Registry Editor (2 Options). Start menu: Click Start > enter “regedit” in the search box. Start screen: click Windows key + C on your keyboard to open the Charms > Select Search > enter “regedit” in the input field. 5. 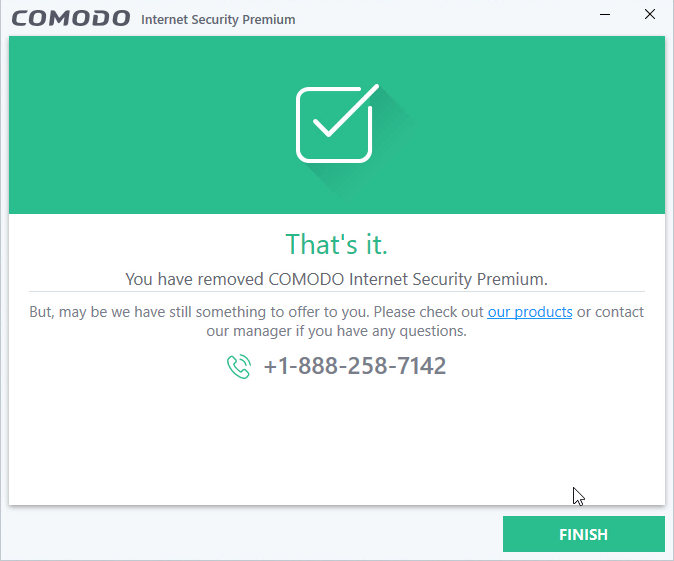 Delete the remaining files (entries) to fully remove Comodo Internet Security Premium 2019 from your PC. Now you’re removing the files that regular uninstall might leave behind. Before doing this, you might want to back up the registry in case of any mistaken deletion. A lot of keys named after the program’s name or as a mix of numbers and letters that probably make no sense that belong to different programs are contained in the Uninstall folder. Check if you can see this folder: HKEY_LOCAL_MACHINE\SOFTWARE\COMODO. If found, delete them to completely remove Comodo Internet Security Premium 2019. Then check your system tray (right end of the taskbar) and Task Manager (hit Ctrl + Alt + Del to open), if you don’t see Comodo Internet Security Premium 2019 persist then the removal was successful. 1. 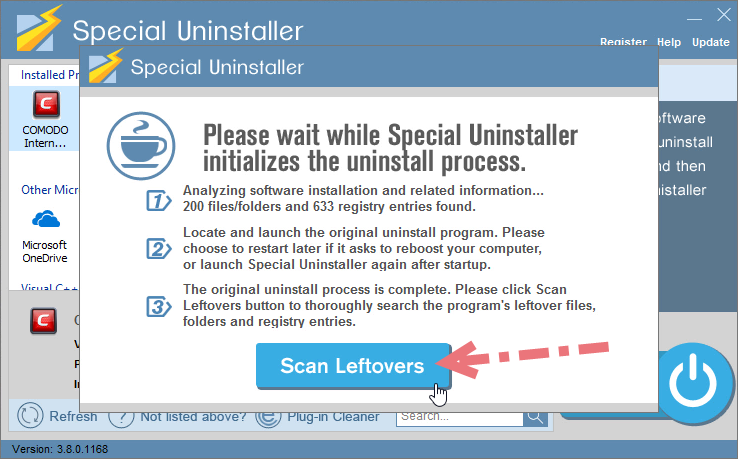 Download & install Special Uninstaller. 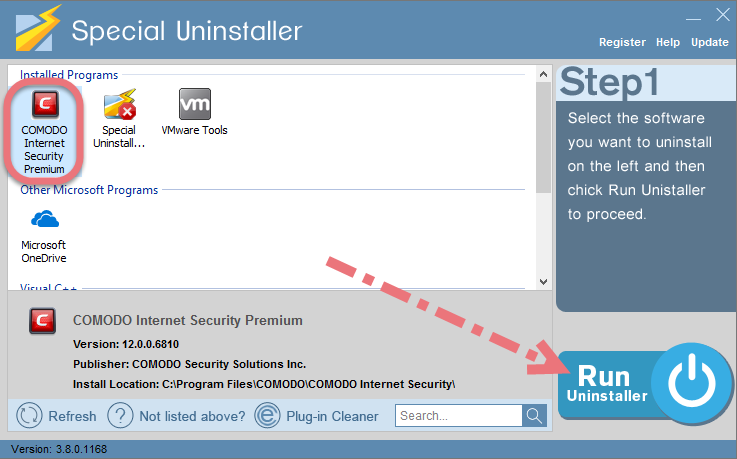 Click any of the blue download buttons on the page to download & install Special Uninstaller, then run it. 2. Remove Comodo Internet Security Premium 2019. 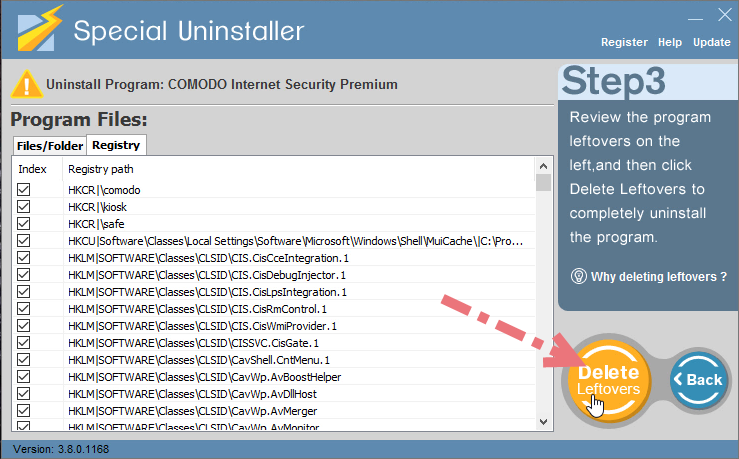 Select COMODO Internet Security Premium in the Programs list, and click Run Uninstaller, follow the on-screen instructions of proceed and confirm the removal. 3. Delete the registry entries. Click Scan Leftovers, and you will see a list of deleting files and registry entries (leftovers) of the program. You can review the list for details including their names and locations, then click Delete Leftovers to fully remove Comodo Internet Security Premium 2019. Clicking Back will bring you back to the list of currently installed programs, so that you can check whether the uninstall was successful.